A high quality rug could last lifetimes if cared for properly and should be cleaned by professionals. Polyester, Nylon, Polypropylene, Triexta varieties. Most synthetic area rugs can be safely cleaned in your home, much like the wall to wall carpet that is installed. Our low moisture cleaning process does not typically penetrate the rug backing, so we are able to clean rugs without disturbing the floor beneath. It is recommended that wool rugs are cleaned differently than synthetic rugs in order to fully remove the soil they can hold. This is due to both the wool fiber itself and the way they are constructed. 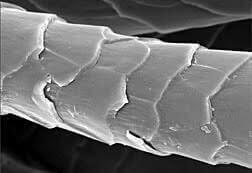 The picture above shows a microscopic view of a wool fiber. You can see in this picture that there are many grooves in each fiber. Each of these “fish scale” like grooves will hold on to dust and dirt until the rug is thoroughly dusted and cleaned. In fact, a wool rug can hold several pounds of soil before it shows any sign of appearing dirty. This accumulation of grit and debris is abrasive to the fibers and over time can cause damage if not properly removed. It is always surprising to see how much dirt is removed from the rugs prior to washing, even rugs that do not appear very dirty on the surface, hold a surprising amount of dry contaminants. These rugs are constructed of plant based fibers which are very sensitive to moisture. When they get wet they release oils that turn brown. They are easily stained and hard to maintain.Typically, soiled rugs need to be cleaned and washed thoroughly, but these fibers like to yellow when wet. Low moisture cleaning with a natural cleaning solution is the only option, with limited results. Steam Green Inc Now Offers In Shop Area Rug Cleaning! For area rugs that are needing extra attention such as pet soiling and urine problems, bring your rugs to us for extensive cleaning and odor remediation! 1. Rug Dusting - use a machine to gently shake loose the dust and fine particles from both the backing and face of the rug. 2. Pretreatment - a neutral ph/ wool safe cleaner that is designed to suspend soil is applied to the both sides of the rug. 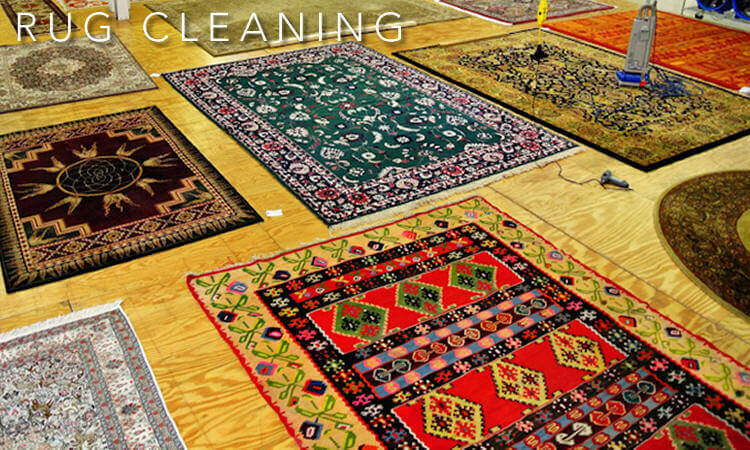 A dye stabilizing treatment will be necessary on all rugs that have been exposed to urine to minimize dye migration. *Pet urine can destabalize the dyes and cause them to bleed into other areas of the rug when exposed to water. We treat the rugs to help stabilize the dye and controll its migration prior to flushing in the “bath”. Urine also breaks down the latex glue in rugs that are backed with fabric. We will do a thorough pre-inspection to determine the integrity of the rug and extent of contamination using a blacklight. 3. Rug Bath - rugs are completely submerged into a rug “bath”. While in the “bath” high pressure water is circulated through the rug at a rate of 85 gallons per minute. This flushes the innermost cotton weft foundation fibers and the soil is agitated loose until the water circulating out runs clear. 4. Fiber treatment - both sides of the rug are scrubbed with soft counter rotating brushes designed to lift the pile and remove any remaining soil from the fiber. 5. Rinse - each side of the rug is thoroughly rinsed and a neutralizing agent is applied. 6. Extraction - the rug is extracted with specialized equipment designed to remove up to 80% of the moisture prior to being dried. 7. Drying - rugs are quickly dried in our temperature controlled drying chamber. 8. Grooming - after the rug is dried, it is groomed with special attention to fringe. The cleaning frequency will depend on level of use and the rugs construction. For example, rugs placed in higher traffic areas like living rooms, dining rooms, hallways and entry ways, could benefit from yearly cleanings. Most rugs should be cleaned every one to three years. Regular cleaning will extend the life and appearance of the rug by removing the soil that causes wear by friction deep inside the foundation of the rug. In most cases it is best to clean and treat these rugs in our shop. Urine can become trapped in the innermost cotton wefts of the rug and even the backing. This requires special treatments and a rug “bath” described in the process stated above for best results. The answer is yes, if you are wanting to preserve the fiber and enhance its ability to resist staining. For instance, wool is a natural fiber and especially sensitive to acidic type stains. The product we use, “Green Guard”, works by coating the fiber and filling in the empty dye sites that would otherwise allow a stain to enter the fiber and stain. The product is negatively charged which enhances the ability to resist soil and dyes that are also negatively charged. You'll find this acid dye blocking treatment being used on most newer carpet today. It is topically applied at the factory and raked into the fiber. This is the same method we use once the fiber is cleaned. Yes we can, but depending on the level of repair required this can be an expensive repair. Tufted rugs require this glue and backing in order to hold the fibers into the mesh they are woven and create a foundation. It is not uncommon for people who own these rugs to find themselves replacing them after 7-10 years. Some people absolutely love their rugs and are willing to spend the extra money preserving them. There are plenty of these rugs flooding the market today from India that don’t even last 2-3 years before the glues start breaking down and leaving powder on the floor. In these rugs, fillers were added to the glue batch to extend coverage and make it cheaper for them to produce. Once the latex starts breaking down, the integrity of the backing and stability of the rugs fiber have become compromised. They may soon begin to lose fiber and shape. Yes, we can clean the rugs at our shop and deliver them when they are ready. Available upon request.